single-circuit configuration, axial-flow fans, condensing coil with copper tubes and aluminum fins, plate heat exchanger on water side and electronic expansion valve as standard equipment. Flexible and reliable unit; it easily adapts itself to different thermal load conditions thanks to the precise temperature control together with the use of inverter technology. The high performance’s level, both full and partial load, is achieved thanks to the accurate unit’s design and to the use of variable speed (inverter) motor. The chillers i-BX are used in many applications, even completely different from each other, suitable for comfort and industrial processes, without making any compromises. The keypad features function controls and a complete LCD display for viewing data and activating the unit, via a multilevel menu. The remote keyboard kit wired indoor and outdoor temperature sensors allow dynamic control of delivery temperature water, optimizing comfort in the room and increasing the energy efficiency. night mode to limit the noise level of the units. Noise level is reduced limiting the maximum speed of the compressor and fans. The highest level of efficiency at part load, thanks to the inverter technology, can meet and exceed the minimum seasonal efficiency for cooling, SEER, according with the eco-sustainable design requirements for all products using energy. For this reason, the unit represents the best choice for all the hydronic application on the residential and commercial markets. The unit is suitable also for industrial market, satisfying the seasonal energy performance ratio SEPR. The unit is designed as a system: all components are regulated using proprietary control’s logic for the highest efficiency. 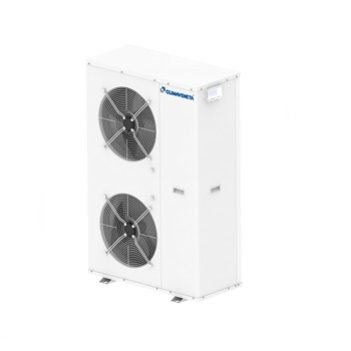 High seasonal efficiency in both heating and cooling mode, using DC inverter technology to modulate compressor operation and deliver the exact amount of energy based on the actual needs of the building. High efficiency for low energy consumption during the operating hours. Full load operation is ensured with outdoor air temperature up to 46°C during summer and down to -10°C of outdoor air temperature during winter. Production of evaporator leaving water temperature from -8°C to 20°C. The integrated hydronic include all the water circuit components (anti-freeze electrical heater on plate heat exchanger, air vents, flow switch, water filter, safety valve, EC water pumps, expansion tank) so as to optimize installation space, times and costs.